This afternoon Jen boarded a plane to Portland, Oregon, leaving me all alone. Those familiar with the blog know the wild exploits I get up to when Jen is away. There was that time I made an egg sandwich, that time I made some pasta and had some shiraz, that time I had a kale salad, that time I had some pickled herring, that time I mimicked the Dominoe's Bread Bowl Pasta, that time I cut my finger and had some leftover chicken, that time I made catfish with zucchini crust, and who could forget that time I made a weird chicken salad. Yeah, I've had some wild times when Jen's been out of town. Now you can see why she's such a jealous woman. We have major trust issues and I take full responsibility for my part in that. We're working on it though. Our counselor says that every relationship is like a garden. We're just watering ours, brother. We're just watering ours. Given my new passion for budgeting I opted to do no grocery shopping at all to make tonight's meal. 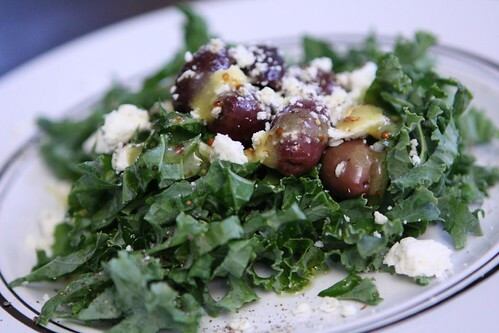 I made this salad with leftover kale, kalamata olives, feta cheeses, and a vinaigrette made with whole grain mustard, lemon, Lyle's Golden Syrup, and olive oil. 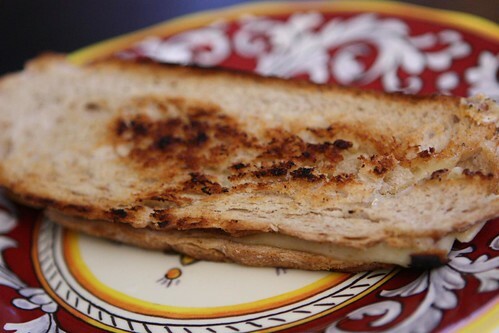 I used up some old bread to make this grilled Gruyere sandwich with Sweet Smooth Hot mustard from SchoolHouse Kitchen. This is my all time favorite mustard and it turned what would have been a boring sandwich into a boring sandwich with delicious mustard! 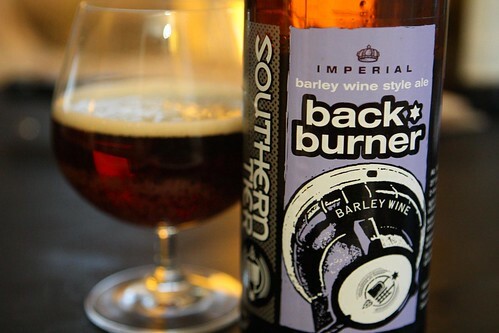 As temperatures have plummeted down into the 30s this evening, I figured I'd warm up with this Backburner from Southern Tier Brewing Company in Lakewood, New York. I purchased this about a year ago and it's been just hanging around in my beer cellar waiting for a good excuse to be enjoyed. It turns out our building, as is often the case, had issues with the heat turning temperatures extremely high throughout our living space even with windows opened on this wintery night. If I sat close enough to the open window I could pretend it was cold enough to really get the maximum amount of enjoyment out of this wonderful winter beer. I made some granola the other day using the leftover grains I'd had from my last two batches of beer. I dried them out in the oven then added Lyle's golden syrup, Canola oil, crushed almond, and crystallized ginger. I also put in some dried dates which ended up hardening considerably in the oven in a turn reminiscent of last year's chestnut granola debacle. Luckily I don't think the dates have achieved quite the same tooth-cracking density as the chestnut pieces in that ill-fated batch of granola. Next time I make granola with any sort of dried fruit I will just toss them in at the end. 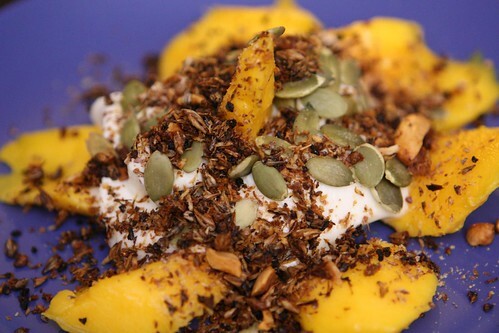 I used a little of this granola on top of some yogurt with a little honey, flax seed, and sliced Ataulfo Mango, my mango of choice. I would have used this Atualfo Mango for our Week 19 pregnancy theme meal but they were sadly unavailable. 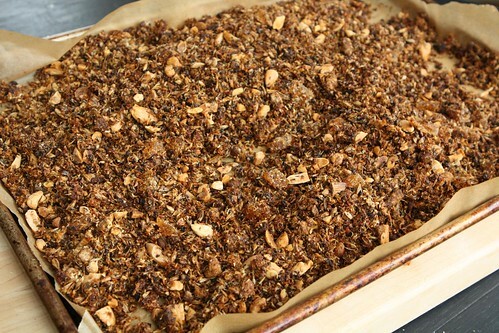 At times the granola is a bit too aggressively crunchy but at the end of the day it's tasty enough to give it a pass. Sure, I have to pick out bits of toasted barley malt out of my teeth at the end of eating but that's just the cost of saving money. That amount of savings is going directly toward putting our boys through their first half-second of college.